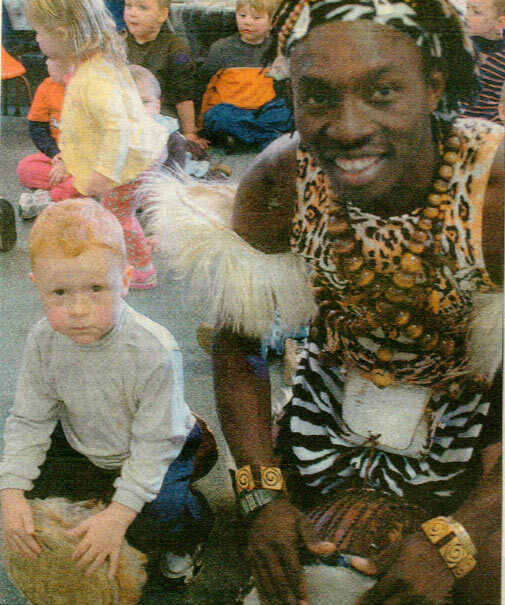 Children at the Kookaburra Korner Early Education Centre were given a taste of African culture this week, thanks to a visit from the Jambo Welcome to Africa team. 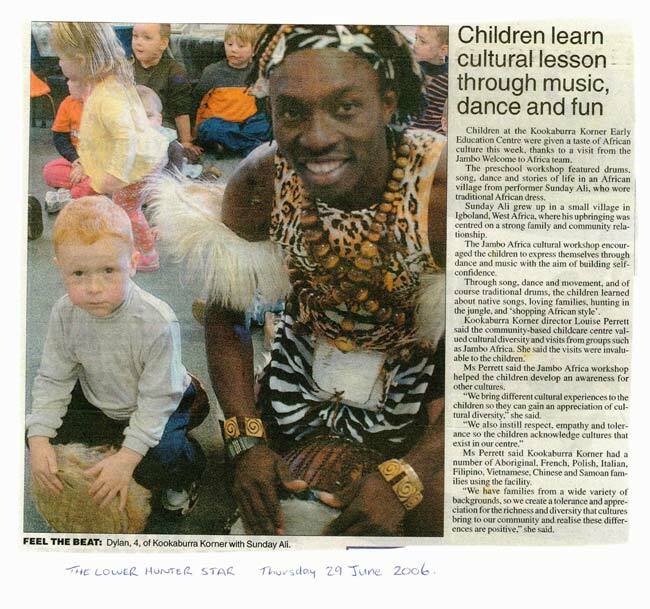 The preschool workshop featured drums, song, dance and stories of life in an African village from performer Sunday Ali, who wore traditional African dress. Sunday Ali grew up in a small village in Igboland, West Africa. His upbringing was centred on a strong family and community relationship. The Jambo Africa cultural workshop encouraged the children to express themselves through dance and music with the aim of building self-confidence. Through song, dance and movement, and of course traditional drums, the children learned a lot. For example, about native songs, loving families, hunting in the jungle, and ‘shopping African style’. Kookaburra Korner director Louise Perrett said the community-based childcare centre valued cultural diversity and visits from groups such as Jambo Africa. Additionally, she said that the visits were invaluable to the children. Ms Perrett said the Jambo Africa workshop helped the children develop an awareness for other cultures. “We bring different cultural experiences to the children so they can gain an appreciation of cultural diversity.” she said. Ms Perrett said Kookaburra Korner had a number of Aboriginal, French, Polish, Italian. Filipino. Vietnamese, Chinese and Samoan families using the facility. “We have families from a wide variety of backgrounds. That’s why we create a tolerance and appreciation for the richness and diversity that cultures bring to our community. Moreover, we realize that these differences are positive,” she said.